Summer is winding down, and I am giving all my favorite citrus fragrances a last hurrah before putting them away until deep winter, when they will move to the front of my cabinet again so that I can pretend it isn't really freezing cold outside. Annick Goutal Eau du Sud is one of my favorites (see my Top 10 of Summer list). It was launched in 1996, and has notes of bergamot, mandarin orange, grapefruit, lemon verbena, peppermint, basil, persian lime, and woods. Eau du Sud starts with strong citrus, heavy on the bergamot and grapefruit. There are light herbal undertones; the mint and basil are noticeable but subdued. As it dries down, it takes on a slight but distinct smoky note — tobacco leaf, maybe? — and farther on, there is a tinge of sweat hovering underneath the verbena and woods. The smoke and sweat are light enough that I find them distinctive rather than repulsive, but many find Sud too harsh, and although it is unisex, it leans more towards masculine than the other Annick Goutal unisex fragrances. If it doesn't suit you, you might try Eau d'Hadrien, which I would guess outsells Sud by a mile. Hadrien was released in 1981 and has notes of lemon, grapefruit, citron and cypress. It is lighter, simpler, smoother and more cheerful. I love the mixture of citrus and cypress in the top notes, but most of the citrus disappears in short order, and the dry down doesn't hold my interest. If I want lots of lemon, I'd rather wear yesterday's Mediterraneo. Eau du Sud and Eau d'Hadrien are each available in two bottles: the men's, shown above, and a girlier women's version. The juice is exactly the same, so buy whichever bottle you find most attractive. Eau du Sud is available as Eau de Toilette only; Eau d'Hadrien can be purchased in Eau de Toilette or Eau de Parfum concentrations. Annick Goutal fragrances are available at major department stores and many online discounters. A side note: if you have any recommendations for other fragrances with lots of cypress, please comment! Update: Eau d'Hadrien is widely reported to have been significantly reformulated in 2009. I have not tried the new version, and I have not heard anything about Sud but it seems likely to have been redone as well. Hi R – Eau de Sud just didn't work with my chemistry. Can't blame the scent for that now can I? Eau de Hadrien worked better although it didn't hold my interest long. What it did do was introduce me to the AG line and thus giving me a scent – Eau de Camille which I wore for over 4 yrs exclusively – yes, there was a time when I only wore ONE scent. Sometimes I miss those days…whew that second passed Great last hurrah review for summer. The last scent I wore exclusively might have been Jean Couturier Coriandre way back in junior high school, although certainly up until very recently I never owned more than 3-4 scents at a time. For some reason, the citrus in Yo, Adrian hangs out for much longer than I expected, and I really like the drydown. I can't get into Eau de Sud, though. It's too armpitty for me. Eau de Sud is definitely much more interesting, but I tend to wear Eau d'Hadrien more, because it reminds me a particular limoncello making summer with my best friend. Great to revisit Eau de Sud through your reviews. I find lots of cypress in Tam Dao, but only in the middle notes. I will think of others. I cannot deny that Sud is armpitty. Sometimes I can't take armpitty (Cartier Declaration) but here it doesn't bother me…but I am sure that is why Hadrien is way more popular. R, I just recently discovered Eau d´Hadrien after finding it in your top ten list of summer fragrances. I had a sample of it for at least two years & didn´t know…how silly! I like it a lot & it´s a shame that I didn´t discover it earlier – now summer is almost gone (Well, over here we didn´t have a summer at all…!) & I try to focus on fragrances that are better suited for autumn & winter. But it´s on my “to buy”-list for next year. It is refreshing without being to masculine – I don´t like these combinations of citrus fruits & tobacco that you can find in too many summer fragrances. Perhaps I also have a sample of Eau du Sud – without knowing…But I could imagine since you mentioned mint & tobacco leaf that it won´t work for me – but anyway: all the AG fragrances are worth trying! This isn't about citrus so much (though there must be some in there) but coincidentally today I put on the The Pour un Ete that you gave me a sample of and NOW I love it! Just in time to not wear it. (F, if you're reading this I will STILL love the sample you sent me. If you sent me one and I think you did ;D.) I used to wear both Sud and Hadrian and liked them both quite a lot. But the perfume river rushes on, does it not. Eau de Sud is not for me, and there is too much lemon in Ead d'Hadrien to suit my taste. Rather my favorite light AG is Folavril, and while I was visiting my sister last week, I discovered AG Des Lys. I wore it every day that I was up there, and think that it may be worth tracking down and purchasing…That is if my sister doesn't decide to give me her bottle! Cypress is often used in chypre to give them a sweet woodsy edge. For instance, Calèche. Cypress tips are a middle note (green, sweet, piney), and they are used in many masculine fragrances–Fendi Uomo, Hermes Rocabar, Rochas Monsieur Rochas, Givenchy Xeryus. These are the ones I remember. Thanks so much V, great list! I tried a lot of the Goutals recently, and found that, while I like lots of them, I wasn't willing to pay the money they were asking for them ($90 CAN for EdT) because they seemed to last about 20 minutes on me. Sud and Chevrefeuille were my favourites, but particularly the latter seemed to die a dog's death in about as long as it took me to get out of the store. Hi S, Hadrien wasn't in my Top 10, but it was probably in one of the other lists that I linked to. Glad you like the L'Artisan, L! It is one of my very favorite Olivia Giacobetti scents. And yes, that river does rush on — can't believe how many new scents have been released this year. Not even sure I have heard of Des Lys, will have to check that out on the AG website. Wow, have you checked some of the online discounters? I don't know about the shipping to Canada, but scentiments has great prices on the AG line. I realize that now Also realize that I must take some French classes, stat!! Sign me up too! My French is pathetic. And shoot–I could have sent you some of my Folavril, R. I've got a big ole bottle! R, it might be reissued again. I liked Violetta very much. I think I tested Violetta when it debuted. It was lovely, but Des Lys just really “clicked” with my chemistry. I'll keep my eyes open for the reissue. Thanks, darling! Off on hols to Provence, tomorrow, so hopefully will be able to do some local sniffing. Assuming I can get anywere near a shop, that is. H works hard at keeping me a safe distance from a spending opportunity…. Oooh these are my two favorite Goutals. I've always been fond of citrus scents, so when I discovered Hadrien, I thought I'd died and gone to heaven. Really it is one of the lovliest fresh lemon perfumes I've ever tried. Sadly it only seems to last moments on my skin, so I haven't splurged on a full size. I received a wee gift-size bottle of it as part of a promotion, so I've been rationing it carefully. Eau de Sud is great as well, but much richer & more masculine. Perfect for cooler weather I think. 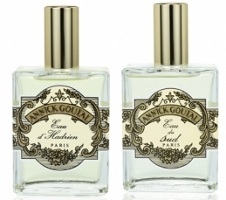 Since trying Hadrien, I've grown to love Annick Goutal's perfume line. While I can't wear many of them, I do appreciate the way they have been crafted. I second everyone's recommendations on Folavril – a lovely and unique smelling scent. I also bought the ltd edition Violette. Lovely, but slightly odd (almost like crushed leaves and twigs). Thank you for sharing your fave summer scents with us! CW, have you tried the Hadrien EdP? The citrus doesn't last long, but the woody dry down does. The EdT is so fleeting on me it is not worth wearing. Going to have to break out that Folavril this weekend! I must try the EDP when I get a chance. The version I have is the EDT and it vanishes in seconds. It's the fresh lemony notes that I crave, although a lingering woody drydown does sound nice. As another poster noted above, prices in Canada for Goutal are outrageous. Would love to hear your impressions of Folavril when you get a chance! My next Goutal purchase will probably be this one. Annick Goutal doesn't use any of the common fragrance 'extenders' meant to prolong the wear of the fragrances. This is why the fragrance tend to be fleeting in terms your ability to smell them once they've hit your skin; they wear very close to the skin and don't project themselves across a room or leave that much of a fragrance trail. To get them to stick around a little longer, try layering it – use the corresponding soap or shower gel before you put some on. This is not marketing mumbo jumbo – your everyday deodorizing shower gel doesn't know the difference between a 'good' smell and a 'bad' one – it will seek out and eradicate any odor it comes into contact with. This little trick will get your AG scent to linger a bit longer. Been a fan of Eau d'Hadrien for ten years or so and during the summer months, I wouldn't consider spritzing on anything else. Thanks Julien for the very infomative comment. The line is not at all overpriced in the US (and can often be found at discount) but I guess it is in Canada. I love Eau d' Hadrien and have been wearing it for years. There's no mention here though of Les nuits d' Hadrien which is a warmer fuller scent – still fresh but more in keeping with the darker colder days of winter. I didn't love Nuits — it just isn't me — but can see why someone would. I really haven't reviewed enough of the AGs at all, and hope to do a week on the subject soon. Many people find that lemony perfume remind them of furniture polish. I love lemon and won't hold its use in cleaners against it, but I can see the objection! My favorite lemon is Carthusia Mediterraneo, but maybe you'd have the same reaction to it, I don't know. I got my first bottle of eau d'hadrien this morning after much anticipation.Well,while there's tons of lemon in the beginning,the drydown is mostly cypress.E'au de cypress would be a more apropriate name I think,with an initial hit of lemon bomb.The funny thing is I like it anyway,the very subtle lemon left over makes it worth it.And best of all,the spot i sprayed two hours ago is pretty much scentless,i dislike a fragrance that hangs on forever unless it has vanilla in bottome notes. Glad you're happy with it, cypress and all. You can probably make the lemon hang around just a bit longer if you apply over a rich cream, but if you like your scents to disappear anyway, perhaps it isn't worth the bother. Ha! I realize you wrote this in 2008, but I just read this comment for the first time and I laughed out loud! So funny!! I started with Eau D’Hadrien as a blind buy……, solely based on reading that Di Caprio wears it….. I view him as a man with good taste in more ways than one…….. Great citrus, different from a lot of the conventional ones…… A must try….